Ironically, the fire does a pretty good job of standing on its own. Firefall is a bit of a running gag for the Co-Opticrew. Not because the game is bad or anything, but because we can always count on Red 5 Studios to have a giant Firefall booth at whatever gaming convention we’re covering. Seriously, they’re show floor landmarks. It’s been awhile since the game was announced. We’ve seen it at just about every show since Spring of 2011 and Firefall is always in one of the biggest booths. But what is it? And better yet, how does Firefall play? 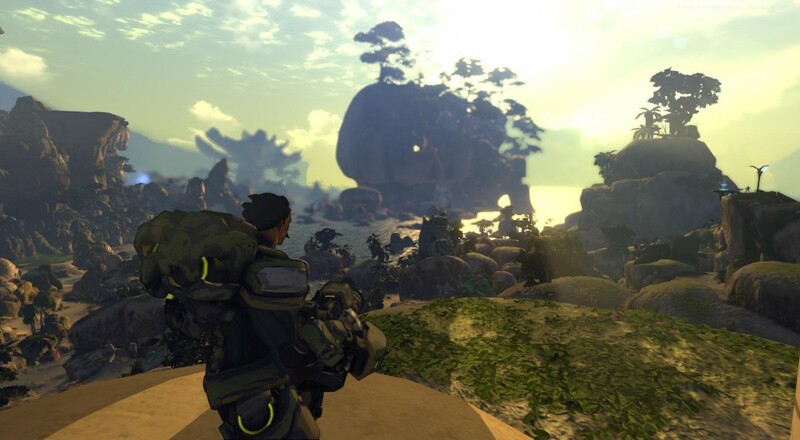 Firefall is a free to play (F2P) third or first-person shooter set on Earth after an asteroid alters our planet forever. Humanity discovers a new power source called crystite and much of the game and story revolves around this mineral and its value/power. In fact the core of the game is all about mining and collecting minerals and raw resources to craft, build, and better your characters. The characters and classes are called Battleframes, and there are five to initially choose from and can be switched to at anytime at battleframe stations. The five classes are Assault, Dreadnaught, Engineer, Biotech, and Recon. Basically balance, tank, defense, medic, and sniper. Each frame has its own set of upgrades, abilities, and levels of equipment. As there is no overall character level in Firefall, your battleframes are essentially your character levels. What’s interesting is how Red 5 handles experience. Every action in the game will earn you experience. Complete quests, mine for minerals, participate in dynamic events - you’ll be rewarded for each of these with experience and items. But if there’s no leveling system, what good is it? Experience it technically a currency in Firefall, so you can spend it to unlock slots in your battleframe to equip skills or upgrade its capacity to equip better items.